Google Notebook is out Of Beta ... Not yet ready ??? 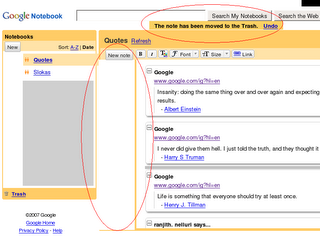 Today Google Notebook is out of Beta. It seems that has still some bugs. I Found couple of glitches. For instance the rendering is completely bad in Firefox in linux. See the attached image. The other problem is, it is magically deleting the items. I added new note and pasted plain text into the box. 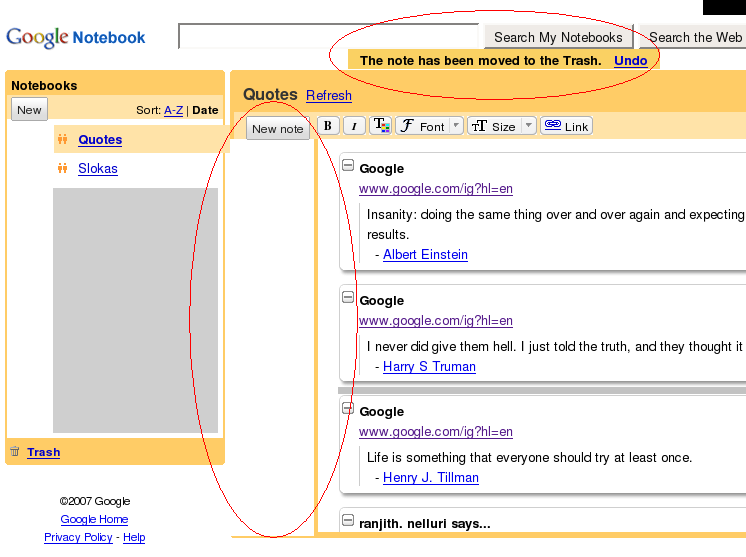 When i click on the other notebook and when i click again on the same note it is deleting the text. The interesting thing is, i observed the above in linux (FC4 with Firefox 2.0.0.3) but i did not observe the same in Windows under the same Firefox version. Can you clarify a bit about what made your items get deleted? I created a new note. I copy some plain text (precisely from kate) and pasted into the note. Next i clicked on another note. At this point of time the newly created note becomes blanked out. Next again i clicked on the blank note and then again clicked on the another note. The newly created note is deleted. I am using firefox 2.0.0.3 under FC4. If you need more info i can give.